So much has happened since my last post, where to start! The past year has flown by. For most of 2014 I was on maternity leave, but I did take a couple of MOOCs, completing my first edX courses. I also started the MOOC research literature browser to help out anyone writing a thesis or paper on MOOCs – many thanks to everyone who has got in touch to recommend additional papers. Contribute to the MOOC literature browser: I’m not going to be able to keep up with new MOOC-related publications as quickly, so I’ve set up a Google form to allow you to add information about new papers. Contributions won’t be ‘live’ immediately but by submitting all the information this way, I can just copy everything straight into the live database in batches once a week. I’ve been having a bit of a Twitter chat today with @dkernohan and @meatyloafy about sources of data for MOOC student demographics, which led to wondering whether the percentages of female and male students in MOOC courses reflects gender differences in traditional university course subjects. 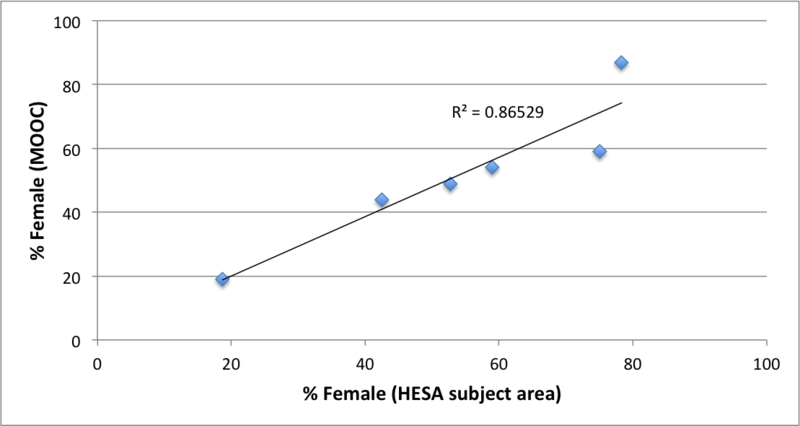 I’d pointed out that gender preferences vary according to course (using the examples of the six Edinburgh MOOCs, in their report here), and David suggested that HESA (the Higher Education Statistics Agency, which collects data about UK HE) could be a useful source for comparison. Source: MOOCs @ Edinburgh 2013 – Report 1 and HESA Table 7, Qualifications obtained by level, gender and subject. Click on the table to enlarge. Raw data can be found in this Google Doc. I wasn’t 100% sure about categorising ‘Critical Thinking in Global Challenges’, but categorised this as Medicine on basis that the instructors are based in Biomedical Sciences. While there is a bit of variation between the two, overall the figures are remarkably similar, so it would suggest that gender differences in MOOC courses do reflect gender differences in traditional courses and subjects (at least, when considering the six courses shown, and comparing to the UK HE sector anyway). I’ve been meaning to jot down my notes on the E-Learning and Digital Cultures (EDCMOOC) course for some time; last week, the University of Edinburgh published a detailed report on their Spring 2013 Coursera offerings, which has given me a bit of a prod to write this post. I was a bit troubled by the view that there were already two groups of students, and a perception that the mass of students who had not engaged in the pre-course (including myself) might spoil it for those who were already engaged. It nearly put me off the course right from the start, but I couldn’t resist having a look at the course content which looked too interesting to miss, so I got stuck in. There were no video lectures; rather, the course material included videos from other sources via YouTube, and reading materials. There wasn’t just one professor at the helm, but a team of five academics. All the course materials were made available from the start, not by weekly release of content. No weekly assessments – in fact no quizzes at all. The course was entirely assessed by a single peer-graded assignment, the creation of a ‘digital artefact’ in relation to the course themes. The grading rubric was also fairly open to interpretation. Strongly encouraged to interact with other students and have discussions – be it via the forums or any social media channels. Initially, this was a bit disorienting – not because I prefer video lectures and linear progression, but simply because that is what I’ve become used to from my experiences with Coursera so far. However, it was easy to adjust and having the extra flexibility through the materials being ‘live’ from the start and not having weekly deadlines made it much easier for me to fit the course around my other time commitments. There were some limitations with this arrangement though. Some students pointed out that YouTube videos aren’t accessible in all countries, and you can’t download the videos to watch offline like you can with most Coursera video lectures. It was also easy to feel overwhelmed by the volume of social media postings related to the course. Although I didn’t contribute much to the social media discussions, I did find it useful to dip in to the Twitter chat every so often. Across the various communication channels, the course team were quite active in answering questions and contributing to discussions, which was helpful. In this sense, there was much more of a tutor presence despite not having video lectures. I chose the topic of learning analytics for my digital artefact, as I thought it offered a lot of potential to be set up in terms of the utopia/dystopia course theme. To make my artefact I used Thinglink, a tool for creating interactive images, which I had not used before but had been introduced to through the course. If you’d like to have a look at my digital artefact, it can be found here. From the small proportion of artefacts that I saw (approximately 2,000 artefacts were submitted), the diversity was fascinating; a collection of digital artefacts from the course can be found here. The digital artefact was a very different assessment model to any of the other MOOCs that I’ve taken to date. It was ‘all or nothing’ – gaining a certificate for the course rested entirely on this one piece of work. However, this pressure was tempered by the fact that as long as you submitted an artefact and carried out peer assessments, you would get a certificate regardless of how your artefact fared in the assessment process. Given the emphasis that had been placed on participation rather than assessment throughout the course, and that the grading rubric only allowed artefacts to be scored out of 2 (yes, really – 0, 1 or 2 was the range), I was surprised when the course team announced after the peer grading exercise that students with a median score of 1.5 or higher would receive a Statement of Accomplishment with Distinction. The digital artefact submission process had potential for some security issues, as all you had to submit in Coursera was a hyperlink to your artefacts’ public location online. There is nothing but the honour code stopping students from submitting a hyperlink to anything, whether they made it or not. When the next iteration of the course takes place, there will be an existing body of digital artefacts, hashtagged and easy to find, ‘out there’ already. Two things which could reduce the potential for plagiarism might be: (i) for the platform to record the previously submitted URLs and not allow duplicate submissions; (ii) for students to also submit a short reflective text about their artefact and what they were seeking to achieve (this would also assist in the peer grading process, as some students felt their work had been misinterpreted). It was the inclusion of the bit about it being an “introductory undergraduate-level course” that I found interesting. None of my other Coursera certificates include any statements about the level of the material, and I’d thought throughout that it was essentially a ‘taster’ of the Edinburgh E-learning MSc course.